Heat oven to 375°F. Spray large cookie sheet with nonstick cooking spray. Brown ground beef in large skillet over medium-high heat for 8 to 10 minutes or until thoroughly cooked, stirring frequently. Drain. Meanwhile, separate dough into 8 biscuits. Place 2 1/2 inches apart on sprayed cookie sheet. With bottom of flat 2-inch diameter glass or with fingers, press out each biscuit to form 3 1/2-inch round with 1/4-inch rim around outside edge. In small bowl, combine egg yolk and water; beat well. Brush over tops and sides of biscuits. Sprinkle each with sesame seed. 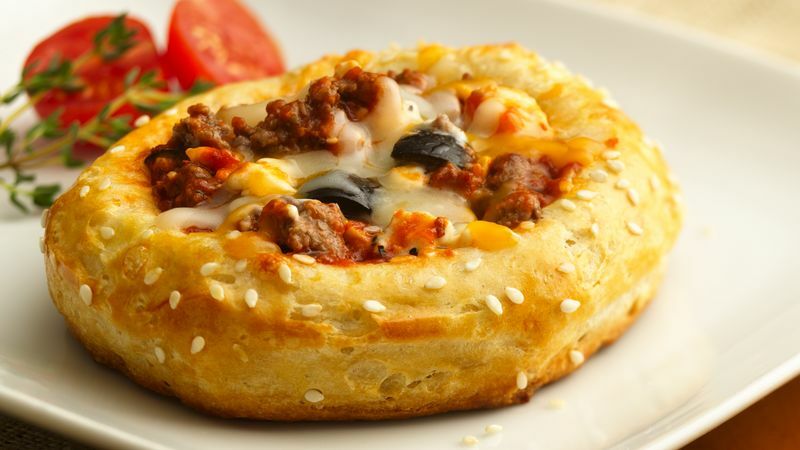 Add all remaining ingredients except pizza cheese blend to ground beef; cook about 1 minute, stirring constantly. Spoon about 1/4 cup ground beef mixture into indentation in each biscuit. Sprinkle each with pizza cheese blend. Bake at 375°F. for 12 to 17 minutes or until biscuits are golden brown and cheese is bubbly. Carefully remove from cookie sheet.